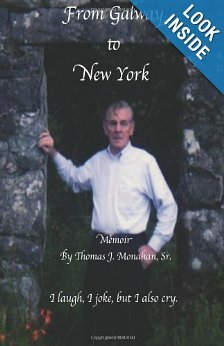 An Irish grandfather’s memoir of his childhood in the Connemara region of Ireland from 1936 and beyond to his life as an immigrant coming to America in 1958. His story of the women he loved and lost, the adventures of trying to make it in New York with little formal education and struggling to achieve the American dream. Passionately told with humor, a no holds barred story spanning over 70 years, written for his children and grandchildren, will be greatly enjoyed by everyone. Thomas J Monahan was born in 1936 in Oughterard, County Galway in Ireland. A plumber by trade, he met and married Mary McCarthy and eventually settled in New Rochelle where they raised their five children. Thomas established a his own plumbing & heating company in New Rochelle and was involved in parish and community affairs prior to the death of his wife in 1991. Thomas currently lives in Bethel, Ct with his lovely wife Margaret.